Incat Crowther has announced the launch of a 24m Catamaran Ferry constructed by Marine. Engineering Consultants. Based on the successful Fantasea Sunrise (launched in 2011), Riverside Avalon is the first of three vessels contracted by Riverside Marine to ferry construction workers to the QCLNG project on Curtis Island. As delivered, Riverside Avalon carries 246 passengers over two decks, with seats are arranged in forward facing rows. Three toilets, including one handicap toilet, are located on the main deck. An additional toilet is located on the upper deck. Vessel boarding is via folding ramps midships and aft on both sides. These ramps are designed to interact with the ferry terminal pontoons in Gladstone and on Curtis Island. These ramps allow much faster turn around times and ease of berthing operations for crew. This vessel has an array of features that are designed to give the vessel a second life upon conclusion of operation at the QCLNG plant. 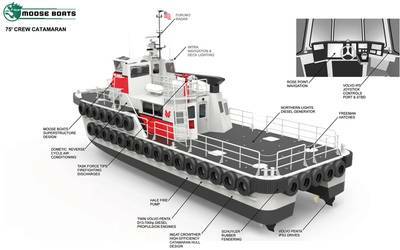 Riverside Avalon features large aft swim platforms and additional support structure for an offshore rescue boat or for a reef transfer vessel. Additional sullage tanks are fitted to the hulls to facilitate waste pump-out from reef pontoons. As delivered, Riverside Avalon is in USL/NSCV 2010 1D survey, but has been designed to be easily transferred to USL/NSCV 1C survey for its second life. A second-life seating layout has also been developed, which will feature lounges and booth seating. Riverside Avalon is powered by a pair of Yanmar 6AYM-WET main engines, producing 610kW @ 1900 rpm. 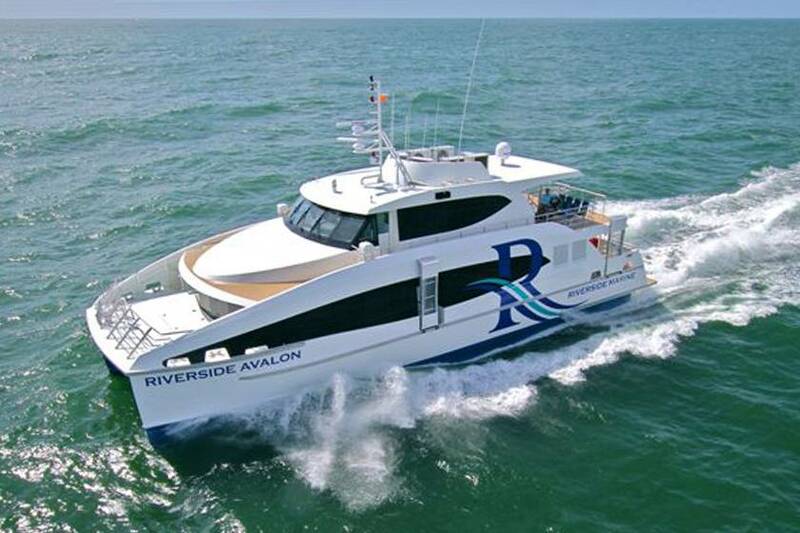 On recent sea trial, Riverside Avalon easily achieved its governed service speed of 25knots. Propellers were selected following studies that showed this was the most efficient propulsion package for the vessel at a service speed of 25 knots. Skegs have been fitted that have been specifically designed to protect marine life in the sensitive Gladstone environment.